I love a lazy weekend, and I'm also really good at doing pretty much nothing. Actually, I'm not sure that's true, these days I always seem to need to be doing something with my hands, whether that's checking my phone, sewing or knitting. But, regardless, I don't find switching off that difficult and I'm a big fan of Netflix binges. Sometimes there is nothing better than a nice long lie in and a great expanse of nothingness planned for the day. Sundays I think are especially perfect for a lazy day as it's right before the working week starts again which for most people is inevitably super busy. Although I don't find it too tricky to switch off I have found with my current job I sometimes have the temptation of checking my work email on a day off. It's a very small team at the Museum where I work so we all end up doing a bit of everything so having a bit of a sneak peek into what you might be expecting for the week to come can become a bit of a habit. I am very much of the idea that work is work and home is home so it's not a habit I want to get into. So on that note here is my idea of a perfect lazy Sunday, take it or leave it as you will! To me there is nothing better then a nice long lie in on a Sunday morning, but only occasionally. It can be really difficult some weekends to battle with your tiredness and your desire to not waste any precious moment of the weekend, but sometimes you just have to give in and savour that cosy morning drowsiness in bed (I probably do this a little too often). I like to partly open the curtains (or try to persuade Robert to do this for me before he heads downstairs) to let the light in and hopefully some early morning sunshine, while I then have a little bit of a doze. After a nice lie in I usually like to either go for breakfast in bed or pull on my weekend jumper and head out to our favourite breakfast place. There are advantages to both, if you're lucky enough to persuade someone to make you breakfast and bring it to you in bed then it means you can while away half of the morning in bed. 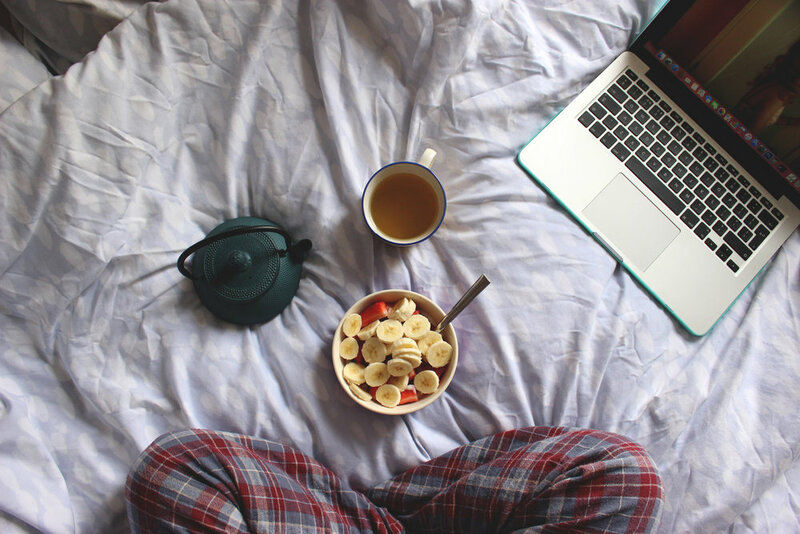 Admittedly most of the time you probably have to stop being a lazy monster and get out of bed to make your breakfast, but that doesn't stop you from heading right back to that comfy spot with Netflix and corn flakes. Sometimes though a proper lazy Sunday can only mean breakfast out for buttermilk pancakes, which are even better when you don't have to do the washing up. If the weather is grey and bleurgh the best thing on a Sunday is to do as little as possible. Cosying down on the sofa with a good cup of green tea, (or your chosen warm beverage, I'm also partial to a bit of white hot chocolate at the moment) cosy knitted blanket and a good selection of movies or your current binge watch can be great for numbing the mind before it gets thrown back into work thinking. Sometimes it's even nice to have a little nap right there too, if you're being super indulgent in your laziness. I don't mean this literally as that could be a potentially highly stressful incident which is the thing I most want to avoid on a Sunday as the working week is stressful enough. Instead getting lost in a really good book, the kind that you just cannot put down is a really great way to while away the Sunday hours. It also means you can get out, take your book along to the park or garden and appreciate any decent weather that you might find, because lets face it you've gotta make the most of that when it's around! So there you have it, my recipe for the perfect lazy Sunday, I'm looking forward to my next one already.